Vitamin D is the healthy “sunshine” vitamin, but it can have a dark side, one Canadian man discovered. It’s a cautionary tale for consumers, medical experts say. “Although vitamin D toxicity is rare owing to a large therapeutic range, its widespread availability in various over-the-counter formulations may pose a substantial risk to uninformed patients,” said study co-author Dr. Bourne Auguste. He’s a clinical fellow in home dialysis at Toronto General Hospital and the University of Toronto. As reported April 8 in the CMAJ (Canadian Medical Association Journal), the man was seen by doctors after he returned from a holiday in Southeast Asia, where he spent much of his time sunbathing. Vitamin D is naturally synthesized by the skin upon contact with sunlight. 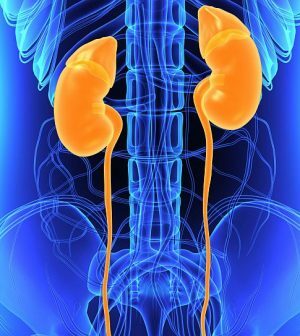 Testing showed that the man had elevated blood levels of creatinine, a marker for kidney damage or malfunction. The patient was then referred to a kidney specialist and underwent further testing. Doctors learned that the man had been prescribed high doses of vitamin D by a naturopath — even though he did not have vitamin D deficiency and no history of bone loss. Over 30 months, the man had taken eight to 12 drops of vitamin D — a total of 8,000 to 12,000 International Units (IUs) — per day. The typical recommended daily allowance of vitamin D is 400 to 1,000 IU, with a higher amount (800 to 2,000 IU) recommended for adults at high-risk of osteoporosis, and for older adults. The patient far exceeded those dosages, however, and that led to extremely high levels of calcium in his blood. It’s those high blood calcium levels that triggered his kidney damage, Auguste’s team said. “Patients and clinicians should be better informed about the risks regarding the unfettered use of vitamin D,” the study authors concluded.